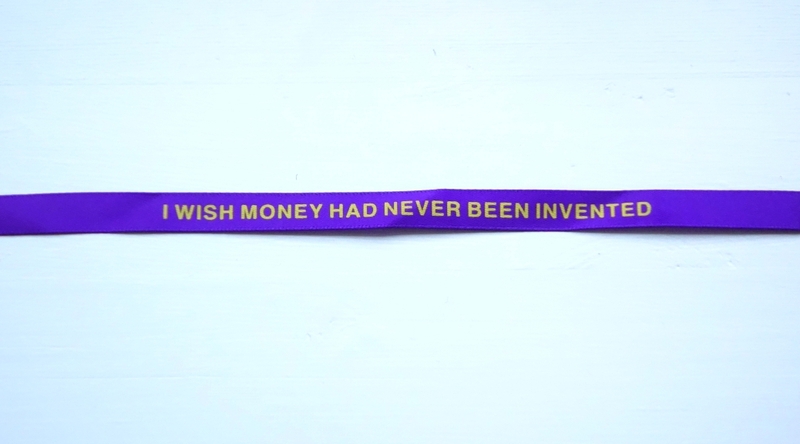 I wish money had never been invented. Not my words, but those of a stranger. Let me explain. I’m on holiday this week, down in Cornwall. We are staying in St. Ives and yesterday we visited the Tate gallery. The current exhibition is called Images Moving Out Onto Space. What happens when art works are set in motion? When they move around the gallery or out into the world? The title is borrowed from a series of psychedelic kinetic sculptures made by Cornwall-based artist Bryan Wynter in the 1960s. But the artwork that I want to talk about is by Brazilian conceptual artist Rivane Neuenschwander. Neuenschwander was born in Belo Horizonte, but she studied at the Royal College of Art, and now lives and works in London. Neuenschwander’s art investigates the role of chance, control and collaboration and explores narratives about language, nature, geography, the passing of time and social interactions. I Wish Your Wish is a room full of thousands of multicoloured ribbons. The ribbons are tucked into holes in the gallery walls. Each ribbon bears a message, one of 60 wishes made by local residents over the previous few months. Visitors are allowed to take away a ribbon. 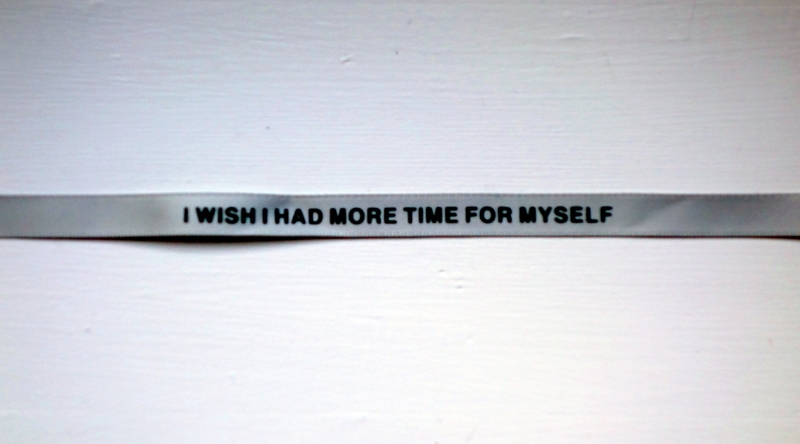 Most people then write a wish of their own on a small piece of paper. They roll up the paper and put it into the hole where they took their ribbon from. The idea is that you tie your ribbon to something – your bag, or your wrist – and when the ribbon wears away and falls off, the wish written up on it will be granted. So the installation moves the art out of the gallery and into the town and beyond. I wish that money had never been invented. I can only guess at the sequence of events that lead to someone – someone living in St. Ives, in 2015 – thinking like that. They have my sympathy. But I also know that they are wrong. Money is one of civilisation’s greatest inventions. In fact, without money there would be no civilisation. It makes human productivity predictable and calculable. It frees us from one-to-one (or family to family) obligations. Money marries the future with the past. Without money, people have to do everything for themselves – grow their own food, make their own clothes. You get the picture. Without money, things would be a lot worse. Just ask anyone who’s lived through an episode of hyperinflation, where people lose trust in money. All that’s left is barter, and life reverts to a daily struggle for survival. The earliest people lived like animals, eating plants and hunting other animals. Food was shared within the family, and then the tribe. Sharing helped survival – it was a competitive advantage. At some point, we stopped the nomadic hunting and gathering and became farmers. And soon after that, we started to trade with the tribes and families next door. But barter has problems. For now, let’s focus on timing – harvest is only once a year. So we needed a system of borrowing against the future. A farmer needs to be able to eat before his crop comes in, and then repay his debts when he harvests. So something scarce needed to be used for trade. Money was originally based on commodities – most commonly gold and silver, but also copper, salt, peppercorns, tea, large stones, decorated belts, shells, alcohol, and cigarettes. Silver and gold seem obvious to us now, but animal furs were probably the first currency. The key thing is that it shouldn’t be a product that is easily controlled. If there is only one gold mine, or one sheep farmer, that’s a problem. Physical goods also have issues with price stability – if someone finds a new gold deposit, or there are a lot of sheep one year, the value of the currency drops. Prices rise and debts are inflated away. Nowadays we just let the government make the money. Today’s money is fiat money, effectively a government debt. Fiat money is controlled by society as a whole, rather than by single special interest group. Conceptually, it represents all the goods and services available in society, as a kind of “grand average”. This means that its price should be relatively stable. In practice, we use a representative basket of goods and services2 to signal fluctuations in the value of the currency to the population. In theory, this stability and neutrality should support the development of a balanced economy. As it happens, at least in Western democracies, it actually does so in practice, too. Concentrate – here comes the science bit. Without money, exchange of goods and services depends on barter, which suffers from the “coincidence of wants” problem. When A trades with B, he may not receive something in return that can be used to trade with C.
Wikipedia uses the example of a bar musician “paid” with food and drink, which cannot then be used to his rent. If the landlord held a party that the musician could play at, this would be a coincidence of wants. We’ve already mentioned the additional problem of timing – seasonal goods like foods can only be traded when they are available. To directly trade fruit for wheat, there needs to be a period when both are harvested at the same time. A unit of account makes contracts involving debt possible. Here money is acting as a standard of deferred payment. To act as a store of value, it must be possible to save, store, and retrieve money. The value of money should also be stable over time. Inflation affects the ability of cash to act as a store of value, which is why so much of investment is the allocation of capital into alternative assets. I hope you can see that despite its flaws, money is one of civilisation’s greatest inventions. The real problem today is that financial education is so poor that many people run into difficulties. So much so that they wish that money had never been invented. That was my own motivation for working towards financial security. Barter is a post money phenomenon – there is no evidence of barter in pre-money societies, although we can’t see the pre-money society’s we cam from. Early money was implicit “credit” – I’ve helped you, you will help me/ we are family/tribe and help each other share. Such systems don’t scale and require personal knowledge for trust. Money is a change to a trust in a commodity that all accept as valuable today and tomorrow, or a system (such as we have now). All modern money is created as credit – a promise to do some work or create something tomorrow for money today.